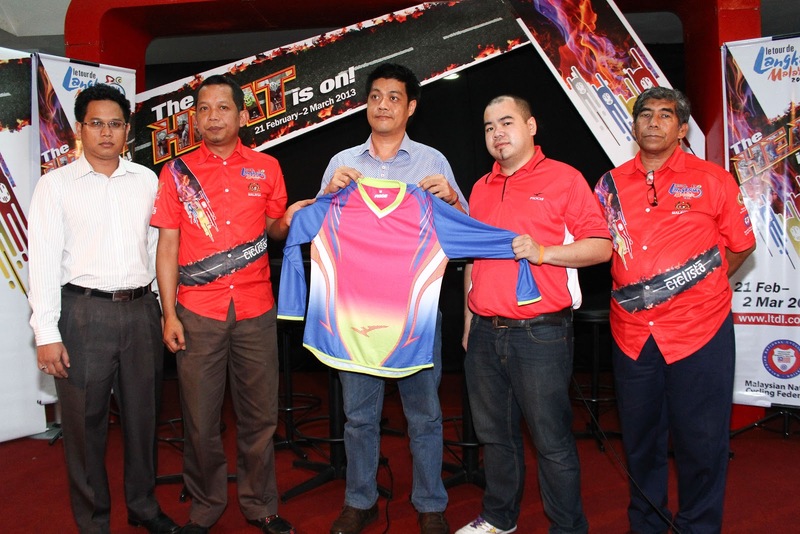 KUALA LUMPUR, MONDAY 4 February 2013 – For the fourth year, the ever popular local sporting goods manufacturer, Figos Sdn Bhd continues to be an official sponsor of LTdL 2013. FIGOS Operations Director, Mr Tang Kok Wai proudly announced that FIGOS will contribute FIGOS Merchandise which includes clothing and sports jacket to the organiser, the merchandise will be for invited guests and officials. This Malaysian sports brand will also be promoting their products in the Cavalcade Convoy during the Tour and all stages of LTdL Carnivals. Mr Tang strongly believes that the Tour is the best platform for promoting their wide range of sports apparels. “This will be our fourth year with Le Tour de Langkawi, I am impressed with the ever growing number of visitors to the carnivals at the finishing line and we have seen our products exposed to a wider audience every year through this prestige event,” He added. “With the increased cycling fanbase in Malaysia, we have decided to produce our own cycling clothing to cater amatur and leisure cyclists, previously we were known for our futsal and football goods, so I hope our new products will be well receieved, I am happy that Figos will be a part of LTdL again.” Mr Tang added. “With the ever growing popularity of LTdL with the ProTeams, the race will receive increased amount of media attention throughout the globe and will provide sponsors with the required impact in meeting sponsorship objectives.” Emir added. The fight for Overall classification is more open than ever as only two previous overall winners will be on the start line: 38 year old Colombian Freddy Gonzalez and Venezuelan Yonathan Monsalve who has now moved to Vini Fantini, Yonathan has not yet won another race since his triumph on Dataran Merdeka in Kuala Lumpur two years ago. “After watching Pierre Rolland winning a mountain stage at the Tour de France in the past two years, I’d love to see him giving a great show in Malaysia as well, we know that he’ll come here with an enormous motivation”, Emir Abdul Jalal noted. Other potential winners of LTdL would be Belgian strong man Serge Pauwels of Omega Pharma–Quick Step, Australian climbing prodigy Lachlan Morton of Garmin-Sharp, Kazakhstani superstar Andrey Kashechkin of Astana came out of the first World Tour event of the year with the assurance of having the capacity to win LTdL because of the rhythm of racing that not all contenders will have in their legs at the end of February. Venezuelans Jackson Rodriguez is the man picked by Androni-Venezuela for moving up from fifth overall last year to the top spot this year. Denmark’s John Ebsen riding for Synergy Baku Cycling Project has the potential to emerge first atop Genting Highlands as he did at the Taiwan KOM challenge in November. South Africa’s Dennis van Niekerk from MTN is no stranger to making the top 5 at LTdL and he’s able to do it again.